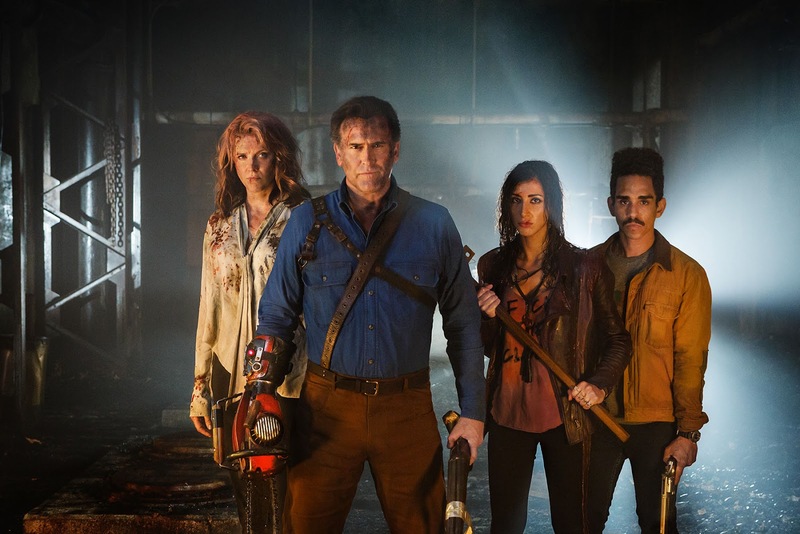 When “Ash vs Evil Dead” roars back into action for season 2 on Sunday, October 2nd, the show will kick it up a notch and will be bloodier, gooier, and gorier than ever before. Bigger and better, STARZ has amped up the comedy and horror to a whole new level. In the clip below, “Ash” Star Dana DeLorenzo (“Kelly Maxwell”) gives you a look behind the scenes on how the show creates the buckets and buckets of fake blood needed to give it it’s quintessential look. The cast is led by Bruce Campbell (Evil Dead, “Burn Notice”) in the role of Ash Williams; Lucy Lawless (“Salem,” “Spartacus”) as Ruby Knowby, who now possesses the powerful Necronomicon; Ray Santiago (“Touch,” Meet the Fockers) as Pablo Simon Bolivar, Ash’s loyal sidekick dealing with the trauma he suffered in the cabin; and Dana DeLorenzo (A Very Harold & Kumar 3D Christmas) as Kelly Maxwell, who, grief-stricken after the death of her parents, plots revenge against The Evil Dead. Lee Majors (“The Six Million Dollar Man”), Ted Raimi (“Xena: Warrior Princess,” Spider-Man) and Michelle Hurd (“Law & Order: SVU”) join the series this year as Brock Williams, Ash’s father, Chet Kaminski, Ash’s childhood best friend, and Linda, Ash’s high school love respectively. Sam Raimi serves as Executive Producer with Rob Tapert (Evil Dead, “Spartacus,” Xena: Warrior Princess”), Bruce Campbell (Evil Dead, “Burn Notice”) and Ivan Raimi (Drag Me To Hell, SpiderMan 3) along with Craig DiGregorio (“Workaholics,” “Chuck”) who serves as Executive Producer/Showrunner. Aaron Lam (“Spartacus”) and Moira Grant (“Spartacus”) serve as Producers.